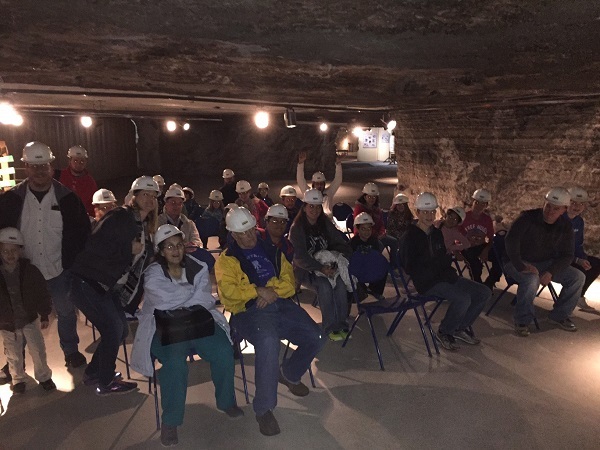 HUTCHINSON, Kan. (Feb. 17, 2017) – Injured veterans and family members experienced a subterranean adventure during a recent Wounded Warrior Project® (WWP) trip to Strataca, an underground salt museum and former mine. The experience gave warriors an opportunity to get out of the house and connect with fellow service members in their community. Isolation is one of the most significant struggles wounded warriors deal with after serving their country. It can be difficult knowing how to overcome that challenge and rekindle bonds similar to those formed in the military. Participants split into two groups and headed to the mining elevators, which took them 650 feet below ground. The tour included a train ride that immersed the group immersed in total darkness. Visitors even played amateur excavator and took home samples they collected. These connection activities support the recovery needs of warriors by reintroducing them and their families to the bonds experienced during military service. In a WWP survey of the injured warriors it serves, more than half of survey respondents (51.7 percent) talked with fellow veterans to address their mental health issues. WWP offers programs and services that assist injured veterans with mental health, physical health and wellness, career and benefits counseling, and connecting with other warriors and their communities. Generous donors make it possible for wounded warriors to take part in outreach activities and benefit from program resources at no cost to them.